While varying in specific morphology, metates adhere to a common shape. They typically consist of large stones with a smooth depression or bowl worn into the upper surface. 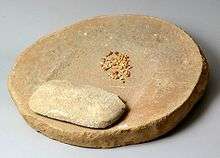 The bowl is formed by the continual and long-term grinding of materials using a smooth hand-held stone (known as a mano). This action consists of a horizontal grinding motion that differs from the vertical crushing motion used in a mortar and pestle. The depth of the bowl varies, though they are typically not deeper than those of a mortar; deeper metate bowls indicate either a longer period of use or greater degree of activity (i.e., economic specialization). 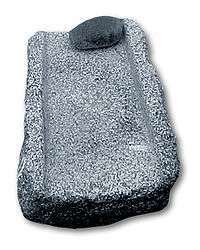 Another type of metate, called a grinding slab, may also be found among boulder or exposed bedrock outcroppings. 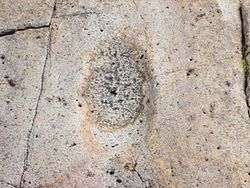 The upper face of the stone is used for grinding materials, such as acorns, that results in the smoothing of the stone's face and the creation of pocked dimples (see image). Some examples are known as effigy-headed metate, which feature an animal’s head at one end, with the metate itself making up the body of the creature. Animals typically depicted are jaguar, crocodile or birds. The most complex type of ceremonial metate is the class referred to as “flying-panel” metate. This style comes from the Atlantic watershed region, including the City of Guayabo and represents a high level of craftsmanship and complexity. Carved from a single piece of stone, these metate typically contain multiple figures, both underneath the plate and on the legs. Trophy heads, birds, jaguar, monkey and saurian figures are the most common themes. The “flying panel” metate is believed to be the precursor to free standing sculptural figures more common later in the Atlantic watershed region. The earliest traditions of stone sculpture in Costa Rica, including ceremonial metate, began in late Period IV (A.D. 1-500). Metate from the Nicoya/Guanacaste region have longitudinally curved and rimless plates. Those from the Atlantic Watershed have a plate that is horizontally flat and rimmed. Both are associated with mortuary goods, suggesting differential social status existed within these communities. The three main types of Costa Rican stone sculpture at this time—tripod-metate, mace heads and jade “axe-god” pendants—peaked and declined in use during Period V (A.D. 500-1000). Stone sculpture was never popular again in the Nicoya/Guanacaste region, but in the Atlantic Watershed (such as from Guayabo) by Period VI (A.D. 1000-1500), freestanding figural sculpture and new forms of ceremonial metate came into use. These new metate types might be rectangular with four legs like the jaguar effigy-head examples or might be round in shape with a pedestal base. These latter types often have carved human heads (or just suggestive notches) around the rim implying a relationship with ritual trophy-head taking. 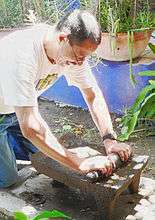 This particular form of metate seems to have been influenced by the stone sculptures of the Panamanian site of Barriles. Costa Rica flying-panel metates date to the 1st and 7th centuries. However, certain features of the Crocodile god depicted on flying-panel metates show him with unnatural U-shaped elbows and long, narrow fingers, as seen on crocodile gods made in gold that date to the 10th-16th centuries. These stylistic forms make sense for use in the small gold ornaments made with the lost-wax technique, but seem strange for use in carved stone. Perhaps these metate date much later than previously thought, and were inspired by the depictions in gold. ↑ Quilter and Hoopes 2003:73-75.